okay. phew. today i bare myself to you. usually i just show the pretty parts, but today i will share the messy bits. this is supposed to be my "dining area." i envision a narrow farm-type table, with a shallow credenza against the wall w open shelving on top for my transferware collection. in reality, this has become my ebay packing/photo shoot accessory storage area. sigh. 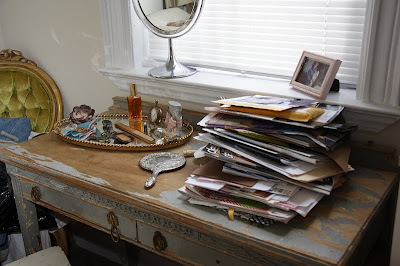 the desk has never totally been organized since I got it. 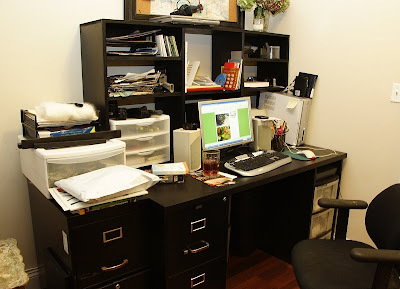 i need to get through the piles (see shelves and next picture) and really file things properly. plus I wish I'd had it made 6' wide instead of 5', AND the desktop is like an electromagnet for dust and animal hair. 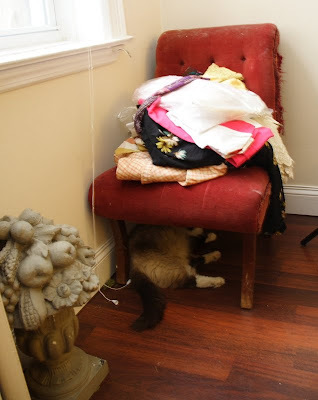 this poor chair is always piled with STUFF. this is the start of me prematurely pulling stuff out for an in-apartment CraigsList vintage clothing sale. this is the "as is" section. nice things that need a little tlc. the cat can stay where he likes. I get that by REALLY MESSY standards this is all probably not too bad. 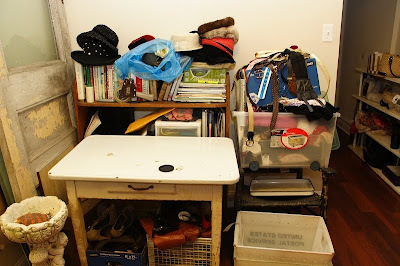 But it's such a small space that Everything Is In View All the Time and I get claustrophobic feeling and a little depressed when I always have mess and disorganization around me. Today's project is The Desk (which includes the pile on the vanity). Wish me luck! Chewy's thinking that maybe if you got another file cabinet, and moved the desk out from the wall, slid the file cabinet there, it would take the place of "wish I'd gotten 6' instead of 5'. He knows this because his mom also wishes her desk was much larger. It is still home though. I still maintain that organization leads to confusion. Its just easier on the eyes. I like other peoples messy bits - theres safety in numbers, it makes me feel not so much alone. And even if the desk had been 6' instead of 5' it still wouldn't be big enough! Thank you for sharing your home with us, I enjoy your blog. Helen. "And even if the desk had been 6' instead of 5' it still wouldn't be big enough!" We set an office in our new short term furnished rentals, New York mid-area, about six months from now. Though it’s not messy, we tried our best to remodel some parts of it. Short term furnished apartments NYC doesn’t need remodeling, but because of my wife’s artistic side, she can’t take not to act like an artist even here in our rented home. And I know you can do that to. Cheers!